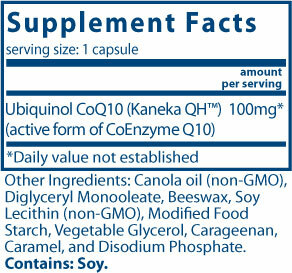 Ubiquinol CoQ10 is an activated form of CoEnzyme Q10 that offers similar benefits. Like CoQ10, ubiquinol increases cellular energy and naturally supports the cardiovascular system, as an antioxidant against lipid peroxidation. Ubiquinol also supports healthy blood sugar levels already in the normal range. The ubiquinol form is thought to offer superior bioavailability. Recommended Dosage: 1 softgel daily with food, or as directed by your healthcare practitioner. EXCLUDES COATINGS, BINDERS, YEAST, WHEAT, GLUTEN, MILK/DAIRY, EGGS, SUGAR, OR HYDROGENATED OIL. If pregnant or nursing, consult physician before taking. © Copyright 2019 Professional Supplement Center, LLC, 5441 Palmer Crossing Circle, Sarasota, FL 34233. All rights reserved. Local time is 4/25/2019 1:55:27 PM.